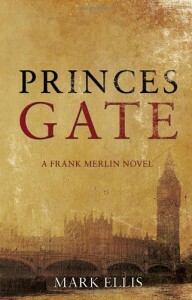 Princes Gate is the first book in the Frank Merlin series. I like books set in London, even better when it's in a historical setting. Set at the early days of World War Two the tension is palpable. When a servant of the American Embassy is found murdered, it's immediately clear this isn't going to be an easy investigation. The story was OK, but a bit too much 'at the end everything that's ever mentioned in this book fits in the murder case' for me. The character of inspector Merlin fits the default description for inspectors in novels. He's alone (his wife died), he's got some kind of physical abnormality, a drinking problem and a boss who's all about statistics and diplomacy. Nothing new here. The story is a kind of classic whodunit, nothing too original but entertaining still. "However, in an area of water near the bridge, at the point where the sharp glare of the daylight became subsumed in the dark shadow of the bridge, the Colonel's attention was caught by an object which, because of the intermittent dazzle, appeared as if caught in the flashing beam of a semaphore light."